Won't be able to see Abdullah Ibrahim's Mukashi trio perform live at the Ghent Jazz festival. 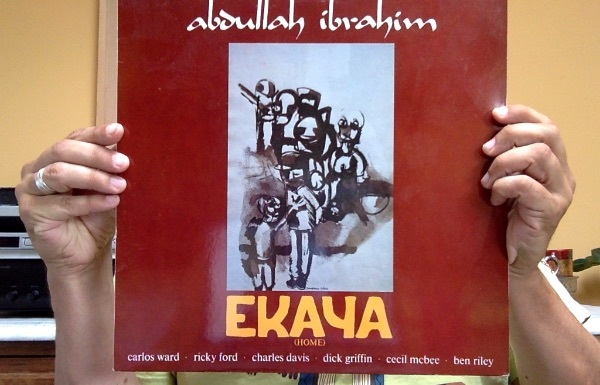 So instead pulled out the Ekaya recording from 1984. A record showing the true soul of Abdullah. Always at ease behind the piano it seems, clever composing goes hand in hand with improvisation. Combined with the feet shuffling rhythmics of South-Africa, his voice is an unique one. Fled from apartheid in the sixties he is longing for Ekaya (Home) and finds some very capable companions on his musical road back. The playing is at times harmonical tight and driving, lovely and laidback at other moments. Alto sax player Carlos Ward stands out with his fierce virtuoso soloing. Recorded by Rudy Van Gelder.